Promote your brand, identify your business, share your marketing message, or be legally compliant with custom vehicle lettering by SignEdge! Your local full-service signage provider, SignEdge creates every sign, graphic, or wrap you need to get your business seen and found. 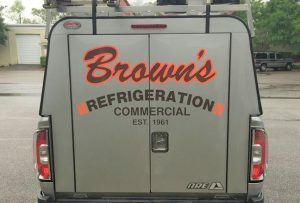 Whether you are looking for vehicle lettering to attract attention to your brand, to promote your products and services, or stay on the right side of the law, we can help. When you want professional, durable letters for your commercial vehicle, there is no better partner than SignEdge. We can make promotional messages from cut vinyl letters at a fraction of the cost of a full wrap. These can be fabricated in any size and applied to any area of your vehicle, from tailgate to hood. Less expensive than wraps, they are also easier to replace, and can be removed and updated quickly and easily. However, because of the many edges individual letters make, there is an increased chance of damage to individual letters than with a solid vinyl piece. We can provide you with replacement letters or update your entire design anytime you desire. 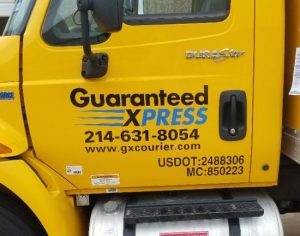 Commercial vehicles frequently use cut vinyl lettering to identify their business or to provide legally required information, such as their DOT number. 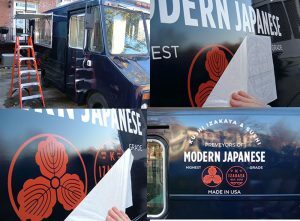 We can make vinyl vehicle lettering that is cohesive with your brand, complements your logo, or that contrasts the color of your vehicle for ultimate visibility. 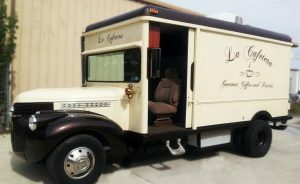 As a full-service sign company, we handle every aspect of the vehicle lettering process. We begin with a free wrap consultation, where we discuss your business visibility and marketing goals. This allows us to ensure that you are getting the most out of your investment. We will discuss any branding guidelines that you currently have, the information you want to be placed on your vehicles, and make suggestions on how to make the professional image you have always wanted. Once we know what you want, our experienced graphic design team will make digital proofs that allow you to see exactly what your vehicle will look like when completed. You may adjust your design as you desire, from the size of the letters to the style, color, and even where it hits your vehicle. Our goal is to make an attractive design that not only reflects your hardworking brand and business but one that helps you reach new market success. After you have approved your final design, our talented fabrication team will quickly and efficiently fabricate the elements of your vehicle lettering and send off your finished project to our professional installation team. For any solution to be truly effective, it must be applied correctly, working with the natural lines, curves, and joints of your vehicle, as well as free of bubbles, warps, and ripples; and that’s exactly what the professionals at SignEdge will do! is the complete package for all of your signage needs. We not only make attractive vehicle lettering solutions, we also custom craft every type of sign you could think of. From eye-catching storefront signs to cohesive interior and exterior signage, SignEdge is your reliable signage partner that can deliver the affordable solutions you need, when you need it. Call SignEdge today at (705) 999-5332 for your Free Consultation with a Vehicle Lettering Expert!